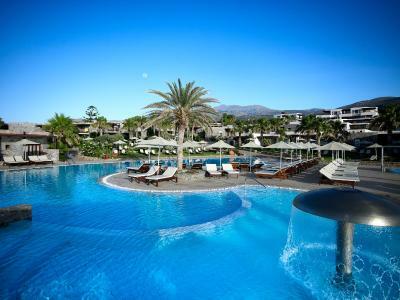 Lock in a great price for Ikaros Beach, Luxury Resort & Spa – rated 9.1 by recent guests! Breakfast had many options. Food was freshly made e.g. Eggs. Freshly baked bread. friendly staffs, personalised services, beautiful and super clean resort, food, music, beach, quietness, swimming pools, water slices, kid clubs, spa. A good location, good facilities, excellent food. Not too many people as end of season. The beaches , warm sea and sun loungers were great. The bar staff were friendly and cheerful but not always too prompt. Stayed with 7 months old daughter, it was perfect! Perfect little village, absolutely beautiful! Very beautiful buildings, plants, flowers, views.. amazing beach, SAND! Its very quiet, clean and calm. Great food. Staff - super helpful, nice and friendly! All in all, just perfect holiday! 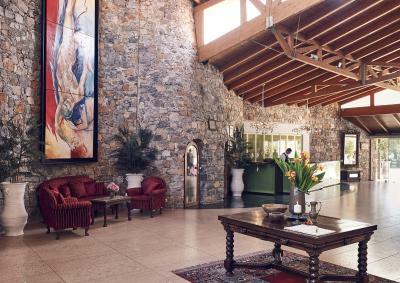 The Hotel looks like as a traditional Cretan village with a big and beautiful territory. Each bungalow has a good location, deluxe bungalows have a great see view. 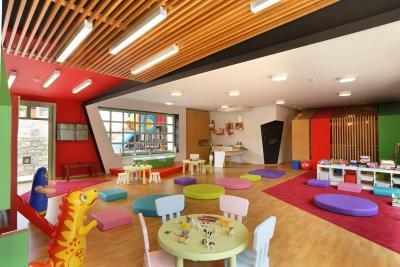 The hotel will perfectly fits families with children and people prefer natural way of relaxing. The restaurant serves great Greek dishes and a wide choice of other international ones. The breakfast is fantastic accompanies with a friendly hotel staff. You will have no concerns if decide to stay here. It is a family resort, so for parents with children would be a good place to stay, with lots to do for the kids. We only stayed one night so didn't use many of the facilities. The service was superb. They tried hard to please and fulfill every wish. The pools were exciting for the kids. 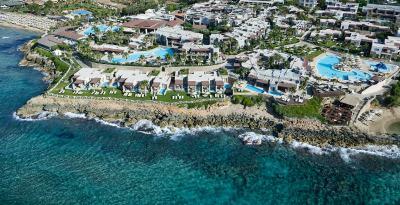 A great location for this beautiful resort on the beach with great view of the sea. Wonderful staff. Delicious food. Beautiful pools and restaurants and bars. Lovely spa facilities. Ikaros Beach, Luxury Resort & Spa This rating is a reflection of how the property compares to the industry standard when it comes to price, facilities and services available. It's based on a self-evaluation by the property. Use this rating to help choose your stay! One of our top picks in Malia.Commanding an enviable location in Malia, the Ikaros Beach Luxury Resort & Spa offers a private sandy beach, 4 swimming pools and delicate dishes of Greek and International cuisines. 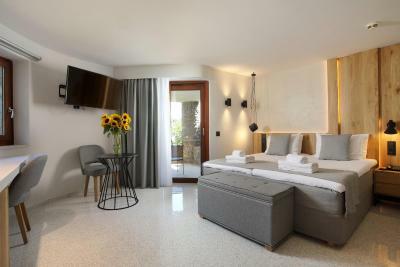 The Ikaros Beach rooms are stone-built and offer views to the sea or the gardens. 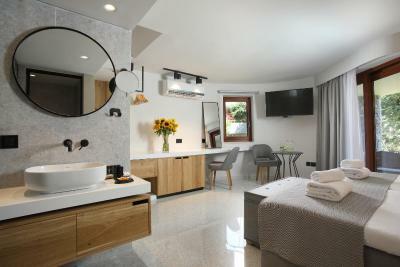 The spacious rooms are modern, with stylish furnishings. 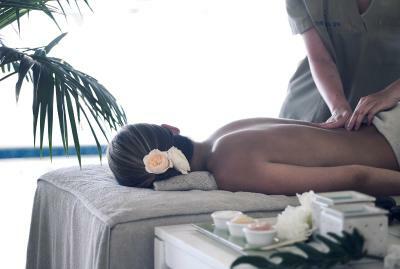 The branded spa offers a range of luxury treatments from expert therapists. Malia resort is within walking distance, with many shops, cafes and restaurants. Heraklion International Airport is 21 mi away from the hotel. 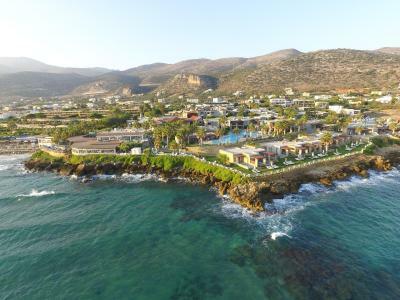 It is a 30-minute drive to Heraklion and Agios Nikolaos. Free shuttle service to Star Beach Water Park is provided. 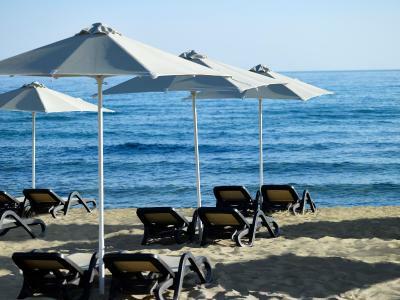 When would you like to stay at Ikaros Beach, Luxury Resort & Spa? These bungalows offer magnificent views of the sea. Large room with separate seating area and terrace with magnificent view to the sea. Features satellite TV, free Wi-Fi and air- conditioning. This spacious suite offers 1 bedroom and 1 sitting room with a double sofa-bed. Features satellite TV, DVD player, and free Wi-Fi. Offers views to the sea. These spacious suites offer an expansive living area, luxurious bathroom and private pool. These rooms are located in the main building and have a balcony with garden views. These rooms are in the main building and have a balcony with sea views. Elegantly furnished bungalows with a view of the grounds. They include an LCD satellite TV. 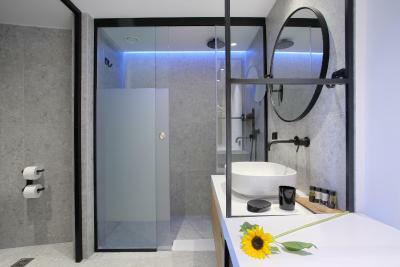 The seafront junior suite features a private pool. Balconies have direct sea views. Elegantly decorated, these luxury suites are right in front of the sea, with furnished porch and a private pool . Features satellite TV, free Wi-Fi, air conditioning and balcony or veranda with sea views. Consists of one bedroom and one sitting room with a double sofa-bed. Includes satellite TV, DVD player, free Wi-Fi, air- conditioning and balcony or veranda. Consists of one bedroom and sitting room with a double sofa-bed. Includes satellite TV with DVD player, free Wi-Fi and balcony or veranda. Privacy, Romance and Stress-free Relaxation are complements of this family-friendly Resort. 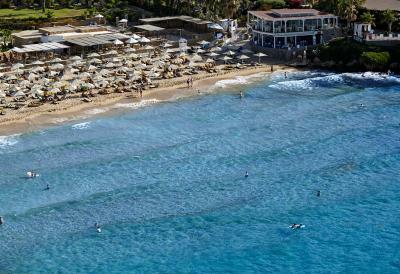 Ikaros Beach Luxury Resort & Spa is stoned-built on a small hill, surrounded by the blue crystal waters of Aegean Sea. 80% of its accommodations have spectacular sea views. You may prefer extra privacy and relax by choosing a bungalow or a suite with private pool or outdoors jacuzzi. The main dining room will offer you excellent service and a big variety of local and international tastes. Enjoy more attentive service and Cretan specialties at our ouzeri and fine service & flavors at Ayeri restaurant. Room service may add to your privacy and will satisfy all your needs from a bottle of mineral to a party by your private pool. Our bars offer relaxing times and views over the sea. Experience the Ikaros style of hospitality and gain long lasting memories and the strong wish to come back. House Rules Ikaros Beach, Luxury Resort & Spa takes special requests – add in the next step! Ikaros Beach, Luxury Resort &amp; Spa accepts these cards and reserves the right to temporarily hold an amount prior to arrival. Ikaros Beach, Luxury Resort & Spa accepts these cards and reserves the right to temporarily hold an amount prior to arrival. Disappointed that there was no tennis coaching available despite taking my booking for a lesson! One outdoor pool was very cold! A towel outside our door to soak up the water from the wall was annoying. The food was abundant and varied but not of the highest level, considering the cost of the stay. Cleanliness - 1. Rooms had ants after first night. May have been the cleaning agents who knows? 2. Sheets not changed,even though with stains. Clarity of terms & conditions + hidden charges/billing- 1. Spa booked and cancelled because my spouse was not feeling too well. We were informed he still had to do this because we would still pay for such a late cancellation. We had not been informed this (24hr cancellation)at the appointment booking. 2. Booked private dinner for couples for €165. We assumed this was for 2 and we would pay extra for wine etc. At the point of payment we were forced to pay double. The manager had not informed us this was per person. It was VERY upsetting to spand €363 for dinner that was not so great! No apology,no concessions. Manager just acted as though nothing was wrong I will not return here!